Do you or someone you love struggle with ADHD, Anxiety, or Autism? Do you want to have better family relationships? Call us at 720-583-9332 to learn more about how neurofeedback can help! Neurofeedback is a well researched & effective way to create change without medication. People all over the world struggle with stress, tension and sensory integration difficulties due to anxiety, ADHD or autism. While any kids and adults rely on traditional methods of addressing these issues, there are those who want a safe, medication-free solution to help reduce symptoms. That’s why we utilize Neurofeedback Training (NFT), an all-natural and effective solution. NFT can help you better regulate and retrain the way your brain functions. Neurofeedback is currently rated as a Level One Intervention for ADHD by the American Academy of Pediatrics. This is the highest category of recommendation offered. Neurofeedback Therapy has more than 35 years of sustainable research. In fact, NFT has been studied and tested across a wide or sensory-related issues, including: anxiety, stress, ADHD and focus-related issues, mild-to-moderate traumatic brain injuries (TBI), and even autism. Improve focus, clarity and memory. Reduce hyperactivity, anxiety and impulse decision making. Decrease anxiety and/or depression symptoms. Minimize noise, sound and texture distractions. Provide a safe, medication-free solution that’s noninvasive. Diminish or eliminate the need for medication altogether. At Mountain Vista Psychology (MVP), we begin by conducting a brief interview to better understand your history and symptoms. After which, we’ll conduct a Quantitative EGG (QEEG) to map out your brain’s function. During the QEEG you can sit back and relax while we collect your brain wave activity. This non-invasive hour-long process includes wearing a cap with 19 sensors attached to your scalp. While the sensors are connected we collect 10 minutes of data with your eyes open and 10 minutes with your eyes closed. This will allow us to read the electrical signals your brain is sending get an accurate “picture” of how we can help. Once essential data is collected, analyzed and run through a normative database, we’ll be able to accurately show you how the difficulties you have been experiencing directly relate to the way your brain is functioning. This initial meeting will not only give you more information about Neurofeedback, but also determine if you’re a good fit for our program. If you decide to move forward with training, we’ll create a custom plan just for you based on brain mapping results and difficulties you hope to resolve. While the amount of sessions varies by person, severity and need, typically 30 to 40 sessions are complete to create lasting change. We’re ready to help you overcome difficulties with safe, effective Neurofeedback training. To begin your journey, simply call 720-583-9332 to schedule an appointment or call us with any additional questions. Neurofeedback & Autism – What is Neurofeedback? We offer a FREE 20-minute phone consultation so you can get your questions answered. We serve many people in Highlands Ranch, Castle Rock, Parker, Lone Tree, Englewood, Centennial, Greenwood Village, and other communities in the South Denver Metro Area of Colorado. 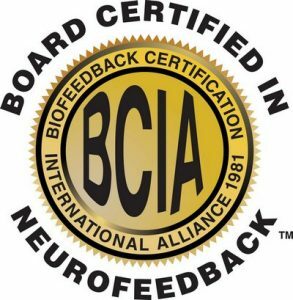 To learn more about Neurofeedback Training, please visit www.isnr.org or www.bcia.org.